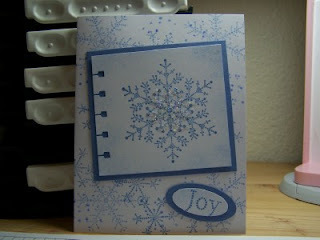 Hollybeary Creations : Snowflake Spot..
Snowflake Spot: Whisper White, Brocade Blue Ink, Oval punches and Spiral Tab punch. dazzling Diamonds glitter. I sponged the blue around the edges of the spiral tab, then I added glitter to the center of the snowflake with a 2 way glue pen. I Stamped one and off for the different shades of the snowflakes.